The research into charitable giving in Northern Ireland found that 89% of people donated money to charity in the last 12 months, an increase from 81% in 2015. The number of people who donated money to charity over the last four weeks saw a similar trend with an increase from 57% in 2015 to 68% 2016. 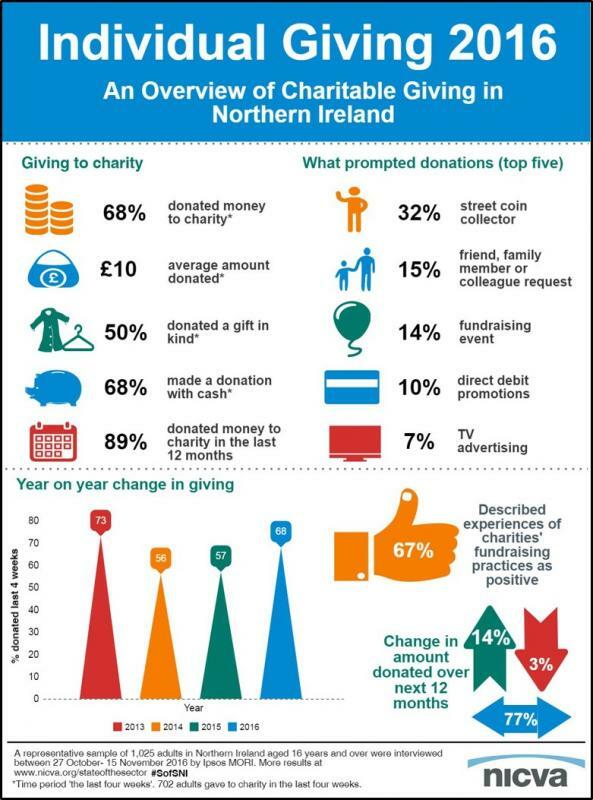 Comparison to UK wide research conducted by the Charities Aid Foundation (2016) suggests that people in Northern Ireland are more likely to donate money to charity than people in other parts of the UK. The youngest age group surveyed (16-24 years) was least likely to have donated money to charity while those aged 45-54 years were most likely to have made a donation. Notably the 16-24 years age group was most likely to state that the amount of money they give to charity will increase over the next 12 months. The average amount donated to charity over a four-week period by donors was £37.80 which marked an increase from £29.99 in 2015. The median donation from donors (£10) over a four-week period however showed no change between 2015 and 2016. The proportion of respondents that gave a gift in kind (defined as a non-monetary donation such as the giving of goods) to charity also showed an increase, from 43% in 2015 to 50% in 2016. The findings also revealed that people were most likely to donate using cash and that street coin collectors were most likely to prompt people to donate. All the results from the research can be viewed on the State of the Sector webpage which can be accessed here. Methodology- Each year NICVA conducts research into charitable giving in Northern Ireland through their Individual Giving Survey. This year’s Survey examined who gives to charity, average donations, how donations were made, changes to giving, barriers to giving, planned giving and fundraising regulation. Ipsos MORI was commissioned by NICVA to distribute the survey through their Northern Ireland Omnibus between 27 October and 15 November 2016. The methodology involved a random selection of respondents from a spread of geographical points and quotas were set on age, gender and socio-economic grade. The survey was completed by a sample of 1,025.